Caretaker Prime Minister Yingluck Shinawatra almost certainly won the Feb. 2 vote, but the disrupted election will face legal hurdles. The central bank may have to cut already-low interest rates to compensate for political chaos. That’s a risky move in a debt-laden economy. 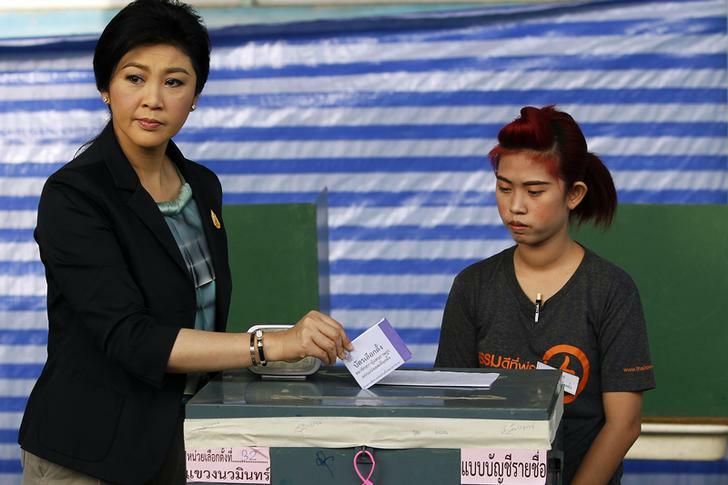 Thai Prime Minister Yingluck Shinawatra (L) casts her ballot at a polling station in Bangkok. Thailand’s Feb. 2 vote saw balloting disruptions in 18 percent of single-member constituencies, or 69 out of 375 nationwide, Reuters reported, citing the Election Commission, which also said legal challenges may be lodged as early as Feb. 3 to try to invalidate the poll. Neither the result nor the turnout has been announced. The House of Representatives has 500 members, of which 375 are directly elected and another 125 are appointed according to votes received by parties. A minimum 95 percent, or 475 members, must be available to convene parliament. Anti-government protestors have already prevented candidates from registering in 28 constituencies. Thailand’s benchmark SET Index rose 1.2 percent to 1,289.5 at 11: 45 a.m. in Bangkok (0445 GMT). The baht strengthened 0.3 percent against the U.S. dollar.